The word psychedelic somehow sounds cool and jazzy. I heard it the first time when someone told me Pink Floyd’s music was psychedelic. I still am not sure what exactly it means but I would call any experience that gives the user some kind of dreamy trance effect beyond the realm of the physical senses as psychedelic. Surreal may be the right word for it. But to me, they are all the same. 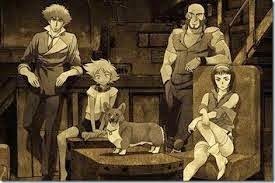 In this sense I call Cowboy Bebop a psychedelic tale. I don’t see too many reviews on the net calling this anime a psychedelic one as such except one episode where the protagonists consume some hallucinogenic mushrooms and end up having a psychedelic experience. I personally however found the music, the art and theme of this anime all combining seamlessly to give me an out of the body experience overall. The tale as such has a very popular setting – a dystopian future. While Medieval Europe with some magic thrown in is the usual prototype for most fantasy fiction, the Wild West with some technology thrown in is the prototype for most dystopian science fiction. The main protagonists Jet and Spike are a pair of space cowboys who make their fortune bounty hunting across space. They are joined by two other interesting characters – Faye and Edward. The format of this series is more or less episodic with the common link being the main characters’ past. As the go from case to case, the experiences serve as a trigger to release the ghosts from the characters’ past and acquaint the readers with Jet, Spike, Faye and Edward. Every assignment the team takes up is interesting and the criminals they are hunting are quite fascinating. Like most of the Manga and Anime, we usually are exposed to the existential crises faced by the criminal that drove them to the world of crime. We then have the protagonists with their own existential crisis and their interaction with the antagonists kind of triggers something in the mind of the viewer as well. This is accentuated by the accompanying music. Each episode comes with a pithy title and the series is scattered with memorable quotes. One of them that stuck with me was – “There is nothing more pure and cruel as a child.” This one is so insightful. We often see innocence as something good but innocence holds equal potential for terrible evil as well. Innocence is a state of complete lack of discrimination between good and evil. I am sure many of us would have seen the ‘little angels’ torturing small insects without realizing the implications of their actions. One of the classic works of literature – “Of Mice and Men” also brings out this aspect where a guileless giant of a man’s innocence can turn deadly to people around him. The episode in Cow Boy Bebop also deals with one such person – the antagonist is a fellow with muddled head who goes on a killing spree just for fun. The series also has quite a bit of dark humor in it. Almost all the main characters have some inherent cynicism in them that comes out in their conversations. There is a bit of situational humor too – in as much in very episode despite all their efforts and ingenuity, the protagonists end up losers due to some quirk of fate. Most of the time, they succeed in their assignment but fate conspires in a comical way to deny them their bounty. Overall I would not recommend this to someone looking for something light and escapist. This is more in the league of the swanky intellectual types or the deeply thoughtful philosophical ones. Overall a great work of art which will outlive the times. Yeah - indeed it is.